The Golf Blog says: It’s time. 6 years without a major win, plus Rory McIlroy’s emergence as the most dominant force in golf since Tiger Woods, have made it clear that Tiger should return to the swing coach under which he had the most success (8 majors): Butch Harmon. Under Harmon’s tutelage, Rickie Fowler has placed 5th, 2nd, 2nd, and 3rd in this year’s majors after not contending in the past. Phil Mickelson, also working with Butch, almost pulled off a miraculous win at the PGA Championship yesterday, only to lose by one shot to McIlroy, who is playing better than everyone else on the planet by a large measure. Before anyone ever cared how many majors I won, I was a kid from California. It’s where I walked, ran, cried, and learned how to play golf. 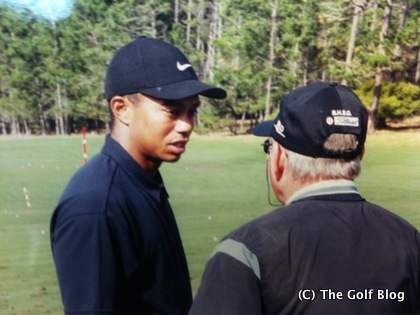 It’s where I first started working with you and improving my golf swing. I didn’t realize it then, but my swing was the most natural and fluid under your coaching. You made a point in not getting over technical with my golf swing and you allowed my natural talents to emerge. They soon did. I trusted your advice and instruction. And I won 8 majors in 6 years, by the age of 27, faster than anyone ever to play the game. Not even Jack Nicklaus won as many by that age. When I left your coaching, I was young and a little stubborn. I thought I could become a better player with another coach, and, to be honest, I didn’t like all the time you were giving to other players and the media. If I had to do it all over again, I’d do things differently. Everybody makes mistakes. I’ve made plenty of them. Leaving your instruction was definitely one of them. I see that now. I’ve grown as a person. I’ve been humbled by the past 6 years. My goal is still to win as many majors as possible, no question. Nothing is given. Everything is earned. You work for what you have. I’m ready to accept the challenge. I want to come back to you. I’m coming home.